STOCKHOLM, Sweden, December 6, 2015 (ENS) – Global warming will happen faster than previously believed, finds new research from Swedish scientists that measures natural methane emissions in a warming world using a unique camera that can photograph and film them. While increased human emissions of greenhouse gases are expected and included in climate predictions, the future development of natural emissions has been less clear; now the Swedish study takes both human and natural methane emissions into account. As a result, knowledge of a vicious circle is emerging. Greenhouse gas emissions from humans burning fossil fuels lead to higher temperatures, which in turn lead to increased natural methane emissions and even more warming. “We’re not talking about hypotheses anymore. The evidence is growing and the results of the detailed studies are surprisingly clear,” says Dr. David Bastviken, professor at Tema Environmental Change at Linköping University. This means that warming will be faster than expected from human-caused greenhouse gas emissions alone. “Everything indicates that global warming caused by humans leads to increased natural greenhouse gas emissions,” says Sivakiruthika Natchimuthu, doctoral student at Tema Environmental Change, Linköping University and lead author of the study. “Our detailed measurements reveal a clear pattern of greater methane emissions from lakes at higher temperatures,” said Natchimuthu. Over the past two years the Linköping research team has contributed to numerous studies that all point in the same direction – natural greenhouse gas emissions will increase when the climate gets warmer. In the latest study the researchers examined the emissions of the greenhouse gas methane from three lakes. The methane emissions increased exponentially with temperature. Professor Bastviken said their work also demonstrates that any reduction in human greenhouse emissions is a double victory. It reduces the direct effect of the emissions on warming, and also prevents the feedback with increased natural emissions. Evidence for these conclusions has come from a camera so advanced that it can both photograph and film the powerful greenhouse gas methane in the air. 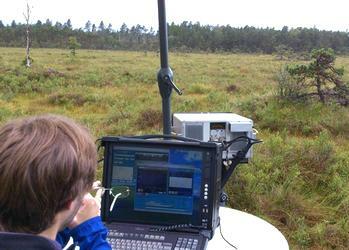 Researchers from Linköping and Stockholm universities have developed the camera to measure and monitor greenhouse gases. “So far the camera has been used from the ground and now we’re working to make it airborn for more large-scale methane mapping,” Bastviken said. The advanced hyperspectral infrared camera weighs 35 kilos and measures 50 x 45 x 25 centimeters. It is optimized to measure the same radiation that methane absorbs and which makes methane such a powerful greenhouse gas, 22 times more powerful than carbon dioxide, CO2. The camera can be used to measure emissions from many environments, including sewage sludge deposits, combustion processes, animal husbandry and lakes. For each pixel in the image the camera records a high-resolution spectrum, which makes it possible to quantify methane separately from the other gases. There are several questions surrounding the greenhouse gas methane. 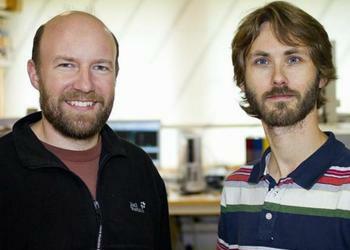 Its rapid but irregular increase in the atmosphere has puzzled researchers. And there is a high degree of uncertainty with regard to the sources and sinks of methane in the landscape. The camera that can help unpack these mysteries was developed by a team that combines knowledge from many different fields of expertise, such as astronomy, biogeochemistry, engineering and environmental sciences.